Welcome to our next interview from the Overlander Interview series, where we've had a pleasure to talk with Elias. He's a guy from Greece who quit his job and chased his childhood dream of overland travel. On the road, he has worked many different jobs to sustain his journeys. Read more to find out about his extraordinary journey! 1. Tell us a bit about yourself, what’s your name and where are you from? My name is Elias Vrohidis and I was born in Greece in 1984. I studied computer science, but I soon realized that I do not want to spend my life in front of a computer screen, so I quit my job and hit the road. That was my dream since I was a kid. 2. You have done some amazing road trips, how did your journey start? While my island-hopping trip in Greece was coming to an end, I was thinking what could be next. The plan was to ride my newly-bought motorcycle to Spain , but this idea wasn’t exciting enough. Then an image came to my mind: me and my motorcycle in front of the Taj Mahal! I was not even sure if Taj Mahal was in India or in China and I did not know whether it is possible to ride a motorcycle that far away. However, I soon started researching about this crazy idea of mine and I realized that it is possible to materialize it. After two years of hard work and preparations, I was on the road to India! 3. Please, tell us more about your overlanding experiences, where all did you drive? My second overland experience was an even longer and tougher adventure… It took me three years to cover 59,653 miles (96,000 km) and explore 39 countries around Africa and the Middle East . That was hard, but it was the ultimate off-road adventure for me and my motorbike! 4. How do you plan a new adventure and how do you find the ideal route? Well, that takes some careful planning… Weather plays a major role on a trip, especially when traveling on two wheels. Firstly, I study the weather pattern over the continent I am going to visit. I try to avoid the rainy season as much as possible. I estimate approximately how many weeks or months I need in each country, in order to visit every place that interests me and explore the country thoroughly. Last but not least, I have to take into account the duration of the tourist visa for each country and the time that it allows me to stay there. At the end, it is like putting together a puzzle with all those parameters, in order to find the ideal route for oneself! I do not like traveling on a schedule, so I try to be flexible and have alternative solutions in case my original plan changes. 5. What machine are you driving and how are you usually sleeping on the road? I am riding an old, small and light enduro (off-road) motorcycle. It is a Honda XR 250S, 1995 model. Most people think that an engine of just 250cc is too small to travel even around one’s own country. However, since I love off-roading, I need something light. I do not care about performance. I just need a reliable motorcycle and the XRs were undeniably among the most reliable ones that have been produced. I am a nature lover, so my favourite thing is to camp in the wild. Ideally, when I ride my motorbike in remote areas, I search for a nice place to wild camp about an hour before sunset. I pitch my tent and then I start cooking. After that, it is time to relax and write my diary, something that I was doing every single night. 6. How is your mechanical knowledge, how much can you fix yourself? While I was studying computer science, I decided to volunteer as an intern in a car repair shop, in order to learn the basics on mechanics. When I started my trip to Asia, I could do the maintenance of my motorcycle and fix the most usual breakdowns. Sometimes I had to call my mechanic in Greece and get some suggestions, because usually the most difficult part is diagnosing the problem. That needs a lot of experience. During my second overland trip, it was much easier for me. I had spent six months to rebuild from scratch two Honda XR 250s. Since then, I can do almost everything on my motorbike and that helped me a lot in Africa, not only in fixing breakdowns but mostly in preventing them. Since my finances are quite poor, I try to fund my trip through many ways. I have been working hard in Greece, while spending very little, in order to save as much as possible. I have done various jobs: computers, waiting tables, cooking, writing and lately, skippering on sailboats. Except that, I was always working while traveling. When I was in Asia, I was writing articles for the most popular motorcycle magazine of Greece, called “Moto”. While I was traveling in Africa, I stopped for two and a half months in the Democratic Republic of the Congo and worked as a waiter in the restaurant of the Greek community. I do have some sponsors too, but usually those do not fund trips. They offered me their products or services, for example: riding gear, spare parts, gadgets, etc. That was already a big help to me, since it saved me a lot of expenses during the preparation of my trip. 8. What does meaningful traveling mean to you? I consider it very important to study and respect the cultures in the regions I visit. This brings back respect and friendly behavior. Nowadays, we live in a globalized world and we are surrounded by people from many parts of the planet. One of the most important things that is missing from our societies, I think, is understanding. We usually do not know much about other cultures and it does not take a long time before we judge anybody around us. Meaningful traveling for me means to learn to understand, accept, respect and be open to different cultures. Once somebody achieves that, we can talk about cultural exchange, which is very important and helps to promote understanding in our world. I think that this is a requirement, if we want to talk about a peaceful world. 9. What are the worst things that happened to you on the road? One of the most difficult parts of the world to travel is West and Central Africa. The biggest headache there, are policemen and army officers. Those have guns and power, so in most of those countries, and in many other ones in Africa, they become the worst criminals. I was threatened many times by policemen or army officers, while I had done nothing wrong. Sometimes they were telling me upfront that if I do not bribe them, I will spend the night in jail. Happily, I was usually able to avoid playing the bribing game, because I was a foreigner. Unfortunately, the locals suffer much more because of policemen and army officers. 10. What is the best thing about overlanding, why are you traveling like this? The most important, I think, is that an overland trip is not about the destination. It is about the trip itself. If I would fly to South Africa , for example, I would not see anything between Greece and South Africa. It took me one and a half year to ride my motorcycle from Greece to South Africa and this way I had countless invaluable experiences until I reached South Africa. An overlander does not just move his body from place to place. He lives every moment of the journey. 11. You have spoken at a TEDxEvent in Greece, what was your main message? The title of my speech was “Breaking stereotypes on a motorbike across Asia and Africa”. I wanted to give the real image of Asia and Africa, the one you see everyday when you are on the spot, which is very different from the usual scary images that are portrayed on the media. Bad news sell. How many people would be interested to hear about the extraordinary hospitality of the Pakistanis? On the other hand, how many people can resist to watch, when they hear on the TV: “20 people were killed today in Islamabad during a terrorist attack...”? These events are so rare that they make headlines around the world but when people get only negative news, they think that these are the only things that are happening there. So, they form a negative image in their mind, which is very different from the image somebody will get, if he visits these countries. That is why my main message was that our world is much better than we think it is, and I try to motivate people to drop their fabricated fears and explore the world. 12. You have already written three books, who should read them and why? Well, first of all, people who can read Greek should read them, because it will all be Greek to those who cannot! Unfortunately, they are not translated in other languages. However, I have published a coffee-table book called “27 Full Moons in the East: Colors and Images”, which is a collection of photos mostly. Other than that, I think my books appeal to people who love traveling and exploring the world, not just having relaxed vacations in a fancy resort. In my books I try to give some information about the different cultures, the people I meet, their problems, their way of life, their happy moments etc. People are one of the most important aspects of my travels. I also explain some aspects of history and religion and I try to do all this through the adventures I experience around the world. 13. Do you have any advices for people who want to do their first big road trip? Most people use the lack of funds as an excuse to stay home. They think that traveling is expensive, but this is not always true. The amount of money somebody spends on the road depends on the level of comfort he needs to be happy. The same applies at home, actually. Not all of us spend the same amount of money. 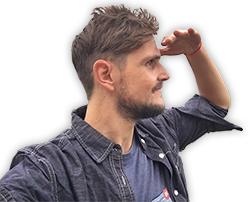 I was traveling for 27 months around Asia and spent just 354 euros per month, which included everything from spare parts to accommodation! It was actually cheaper than staying at home! So if somebody wants to travel no matter how, he must keep in mind that it is possible to do it even on a very low budget. Do some planning and calculate your expenses: fuel, food, accommodation, sightseeing, bureaucratic and other costs. You will see that you do not really need much, especially when you are in the cheapest parts of the world. 14. What are your next plans? I wish to realize my next overland trip in the American continent. I would like to ride the whole way from Alaska to Patagonia. I am sure this is a really interesting part of the world and it could take me several years to properly explore that whole area! Elias Vrohidis was born in Greece in 1984. He has studied computer science, but he soon realized that he does not want to spend his life in front of a screen. So he quit his job and he hit the road to Asia. Since he was a kid, he was dreaming about exploring the world in his own adventurous way. He has done various jobs since then, both at home and on the road: computers, waiting tables, writing articles and books… He is back in Greece for the last couple of years, where he works as a skipper on sailboats, while he is preparing his next multi-year overland trip! Interested in Eliases' journey? You can check out his website or follow him on Facebook. Also, make sure to check out the map of his journeys. Travel mindfully to meet local people around the world and embrace new cultures. Get inspired and inspire others!